As an ecologically-oriented company, C.I.A.K. recognized the need for a stable power source which is being used in renewable energy systems. Utilizing a solar system requires a reliable energy storage in batteries, a fact well known to users who have experienced power failure due to battery fault. Batteries for solar applications have specific technology which ensures high number of cycles under different depths of discharge. 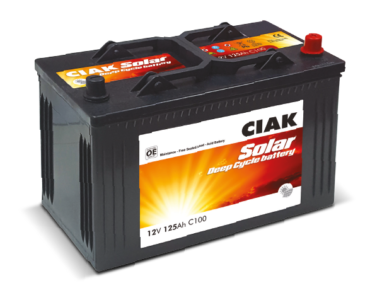 CIAK SOLAR battery range uses proprietary paste formula which ensures safe and reliable power storage over time of usage. The range of models covers stand-alone systems as well as grid-tied systems. CIAK SOLAR is a perfect choice for professionals who seek a high technology battery in a reasonable price range, with wide choice of capacities and technologies. With the upcoming expansion of the newest AGM range CIAK SOLAR will be covering all your needs with capacities from 40Ah to 300Ah.